Providing care to Western New Yorkers is not-for-profit Catholic Health in Buffalo. The system’s biomedical engineering department is an unusual mix of professionals with different affiliations. “We provide clinical engineering support to our five Catholic Health (CH) hospitals and their associated offsite locations. We are responsible for properly maintaining/supporting medical equipment and medical systems to support a safe patient care and treatment environment,” says Allison M. White, manager of biomedical engineering at Catholic Health. “Catholic Health biomed provides medical equipment contract management for the health care system and manages the risks associated with the use of medical equipment technology. We also manage the retired medical equipment repurposing program, coordinate medical equipment training for clinical staff, educate our biomed staff and train biomedical engineering students,” she adds. The department is a rare conglomeration, with associates affiliated with three different entities. “The department is comprised of Catholic Health, TriMedx and Renovo Solutions associates. We have 20 people in the department. The Biomedical Engineering department falls under the Information Technology umbrella at Catholic Health,” White says. “We can see past all our identification badges and understand our one shared vision; to lead the transformation of health care here in the Buffalo/Niagara region,” she says. The unique composition of the department has helped with managing service contracts, controlling costs and keeping much of the work in-house. “Service contracts for medical equipment are centrally managed through clinical engineering. Catholic Health’s clinical engineering department has contracts directly with original equipment manufacturers and some through Renovo Solutions and TriMedx,” White says. “Our partnership with Renovo Solutions and TriMedx allows us to bring equipment to be supported in-house. In many cases, Renovo Solutions and TriMedx would offer better contract pricing to support a medical device in-house. I respect our relationship with both vendors, because Renovo and TriMedx would actually let me know if it would be more cost effective to sign a contract with the OEM,” White adds. The department has been involved in assuring the best use of retiring medical equipment along with having a say in expenditures for new equipment. “We are fortunate enough to be a key player in capital planning here at Catholic Health. We just recently completed the implementation of a multi-year patient monitoring project. We spearheaded the initiative and led the project from planning to completion,” White says. The department is intimately involved in alarm safety. They assembled a multidisciplinary team to discuss the different critical care alarm parameters throughout the system. It was a long process to standardize alarm parameters, but the team is happy to finally be in the middle of the configuration changes. They assist with patients’ heart health as well. “When our Mercy Hospital site rolled out the Transcatheter Aortic Valve Replacement (TAVR) program as part of the Catholic Health Valve Center, our clinical engineering team was very much involved,” White says. “Our biomeds worked on laying out equipment in the room, set up different displays, ran many cables, to make sure all equipment function properly and are sending images and information to the right displays. Every day, our biomed techs at Mercy Hospital of Buffalo would go up prior to each case to make sure everything is hooked up correctly and safe to use,” she adds. White says that the team is always ready and willing to problem solve and be involved whenever possible. “We take pride in stepping up to provide solutions to problems here at Catholic Health. Our sites are notorious for requesting impromptu medical equipment moves. Our biomeds make sure that patient monitoring equipment, telemetry access points, fetal monitors, etc. are moved properly to ensure safe use for patient care,” White says. She says that the teams involvement in the TAVR program has enabled the cardiology and cath lab department to feel comfortable in using the equipment. She says that they know that the department’s biomeds understand the urgency and importance of timely and safe patient care. “Our IT department reaches out to us to manage the infant abduction system. Our Sisters of Charity biomed team takes pride in supporting this equipment no matter what time of day it is. Tom Monnier, (who is the team’s resident guru on our infant security systems) for example, would help the system go back up, if IT is unable to restart services,” White adds. 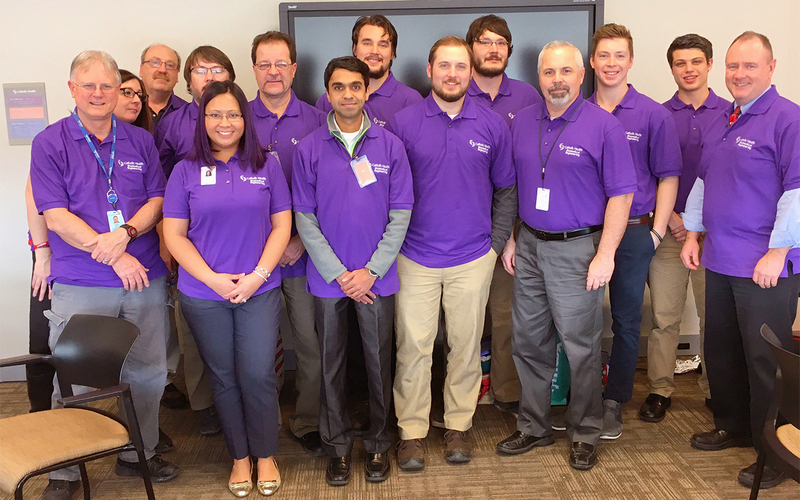 As a blended team of professionals, the biomedical engineering team at Catholic Health Buffalo prove that the whole is greater than the sum of its parts. They coordinate to keep the health care system’s medical equipment running smoothly as they earn the confidence of their clinical counterparts.